It’s finally here, the last movie in the Harry Potter series. Now we can own all of the films and watch them back to back at home whenever we like. We might never leave the TV again! Like the other films in the series, Harry Potter and the Deathly Hallows Part 2 got royal treatment on Blu-ray. Warner has produced a great set that’s rich with behind-the-scenes features as well as a stunning presentation of the movie itself. The film is dark — in subject and lighting — but in Blu-ray’s high-definition video, the blacks are deep and the lighter parts, from firey torches, to magical explosions, to the daylight scenes are beautifully bright. The colors in the movie are subdued by design, but the images are crystal. You can see every detail in the broad landscapes and the more intimate scenes. The Blu-ray’s sound is the real knockout. The magical attacks boom through the speakers and Alexandre Desplat’s gorgeous score draws you right in. As great as the film presentation is, the special features are top notch too. The highlight is the Maximum Movie Mode, a feature Warner uses on a number of its biggest Blu-ray releases. 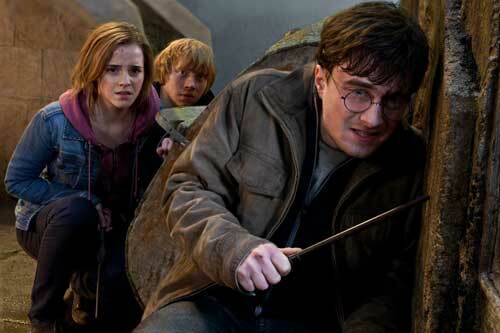 With Maximum Movie Mode switched on, the film periodically pauses and shows related behind-the-scenes footage, interviews, deleted scenes and even the actors reading the equivalent parts of J.K. Rowling ‘s original book . Fans who haven’t read the novels — you really should — will hear some of the differences between what was written and how it played in the movie, such as what led up to that first kiss between Ron and Hermione. Rupert Grint, who plays Ron, laughs about the kiss. “It felt like the most unnatural thing for us [himself and Hermione actress Emma Watson] to do,” he says. The bonus parts offer lots more fun information from the making of the film, including stunts, how the giants were shot, visual effects and sets. This mode also goes back throughout the whole series of movies to show character arcs. None of this is new information for diehard fans, but they’ll welcome the brief glimpses of their past favorite films. Fans of the books will most enjoy “A Conversation With J.K. Rowling and Daniel Radcliffe.” A clip of their talk was leaked prior to the Blu-ray release, but there’s so much more in the piece. The two chat like two people who share a common love. They’re both passionate about the Harry Potter legacy, and it’s obvious Radcliffe has the utmost respect for the series’ creator. They talk about the stories, Rowling’s choices in their writing, her grief for the world when the books were over and lots more. Rowling also shows up in the featurette “The Women of Harry Potter,” in which she talks about her goal of creating strong female characters who aren’t stereotypes, but are both good and evil. Along with the actors who play many of the roles, Rowling tells us about how she sees Hermione, Luna, Ginny, Professor McGonagall, Molly Weasley and the terrible Dolores Umbridge, among other characters. Warwick Davis hosts “The Goblins of Gringotts,” a featurette that looks at the casting of the actors used throughout the series and the makeup work that turned them into different individual goblins. A set of interesting deleted scenes, “focus points” on certain segments of the film and a couple ads for Rowling’s new Pottermore and the Warner Bros. Studio Tour in London round out the impressive set of bonuses on this Blu-ray. Don’t forget, all versions of the Harry Potter DVD and Blu-ray discs go on moratorium in the U.S. on Dec. 29, 2011.